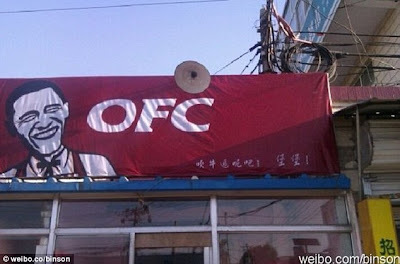 Proving once again my theory that Chinese cuisine was created with Jews in mind, Beijing entrepreneurs made it way too easy for yours truly recently when they opened—wait for it...Obama Fried Chicken! How did those wacky Chinese folks know I was long overdue for another post about CHICKEN? Wait, Obama Fried Chicken is a response to a chicken tax controversy? What is this, some sort of Bizarro World Boston Tea Party? A Chicken Party, if you will? Now that the proverbial chicken has hit the fan (what? ), will the Colonel issue a Chicken Fatwa ("Schmaltzwa"?) on his clearly ripped-off likeness? Or will he take it as a compliment that the Chinese have ditched his "Finger-Lickin' Good!" catch-phrase, in favor of the slogan, "We're So Cool, Aren't We?" (printed in Chinese characters on the awning depicted in the image above)? Will the Obama administration sue for defamation of character? Will Michele Bachmann and Rick Perry start hanging drumsticks from their hats? And what about the coleslaw? WHAT ABOUT THE MOTHERFUCKING COLESLAW?! So many questions. And they all taste like chicken.